More reports are emerging that Microsoft is soon to be releasing antivirus software which will be available for free download. In comparison to it's previous attempt at security software OneCare, it will be free for all Microsoft Windows users, however lacking further features like Parental Controls and other popular utilities found in current security suites like Norton and Trend Micro. Morro will be title of the new software which is claimed to help compat common security threats such as virus, spyware, rootkits and trojens. Also, Microsoft is claim that this software will protect it's users from being infected with fake antivirus tools like the common AntiVirus Pro range. Once Morro is ready for release, OneCare will be discontinued. Microsoft hasn't release a specific dates for release but it is expected to be available later this year. For a while now I have been using Connect360 software on my Mac to connect my XBOX 360 to my iTunes library. This is excellent software and works very well. However, in my scenario, I do not put my videos and movies in my iTunes and have them stored in separate directories while having no intentions of importing them into iTunes. So began a hunt for some new software, and was successful. 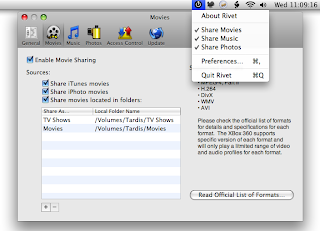 Cyncial Peak's Rivet is very much the same technology as Nullriver Software's Connect360, however I found it better as it allows you to manually define directories where you videos are stored allowing them to be streamed to your XBOX 360. Supporting all the popular codecs (DivX etc.) it works well over Wireless and Wired networks. Security features including the ability to restrict and allow certain IPs and netmasks. Trials are available where the only restriction are the amount of music and video files able to be viewed per session. However, at the price of US$18, it's well worth just perchasing it and getting full capabilities. Depending on your setup on your Mac, the Connect360 software maybe be perfect for you and I encourage you to look at both when choosing a solution. One night I had to restore my entire SQL database server from a SQL file, but it took me a while to find how to restore this file without restoring specific databases. Below are the commands for Linux. Once you have entered the password to your MySQL username, the restoration process will soon begin. If you like the following article and it has helped you out, please leave a comment and let other readers know of you success and thank you for reading my blog. The main reason that the client can't read or "open" the directory is permission issues on the folder denying the client access. When running a Red Hat based (Red Hat, Fedora etc.) server, SELinux is installed and live be default. SELinux controls a second set of folder/file access permissions on top of the standard linux folder permissions system. And because in most cases SELinux is not setup properly, users and administrators are unaware that SELinux is working on this layer. Because of many issues with configuration SELinux, if you don't properly set this up, SELinux will deny FTP access to the folders and also see the access as a possible security threat. In my configuration, the standard linux permission system is fine. Therefore, disabling SELinux resolves this issue. Save the file and reboot you machine. 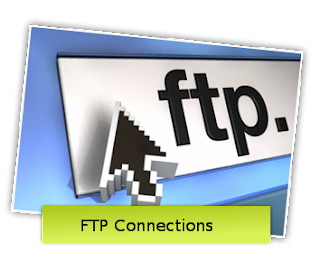 Once this has been done, you FTP clients should now be able to access your folders. This is just a basic outline of the usage and function of the linux command-line command of CHKCONFIG. One of the more useful ways to use this command is to report on a specific service. Note: these commands are best run as either root or using sudo. This command will list init run levels that this service is set to run in. This is the output from that command (example only). *Where , insert the name of the service you wish to delete. This will result in your specified service only running in run levels 3 and 5. This will result in your specified service not running in run levels 0, 1, 2, 4 & 6. Leaving the service to run in 3 and 5. More information can be found at the following links. In Fedora 9/10 & later, it is found that software called NetworkManager which is setup to help with Network configurations especially in the graphical interface (GNOME/KDE etc.). However this utility hinders network operations of those on a command line level. 1) Unable to enable network card (e.g. eth0). 2) Network card won't enable on startup/boot. 3) Command 'ifconfig' does not show any network interfaces other than Local Loopback. 2) Verify your network configuration using the Fedora Network Configuration Tool. Follow the prompts and this should have your network cards configured in no time. After this, the service should then start on boot automatically. Once all this is done, reboot your machine and your network should be working fine. This is simply a quick reference to the Linux Init Runlevels.